All of us have been in a situation where it is hard to say goodbye. At the end of three and a half years in this parish, I find myself in such a situation. Saying goodbye is hard to do when you know that it could be the last. Saying goodbye is hard to do when you have grown to love those whom you now have to bid farewell to. Saying goodbye is difficult because it implies change. When life is good we prefer the comfort of permanence rather than the uncertainty of change. Saying goodbye is hard as the future remains shrouded in uncertainty. But perhaps for many, saying goodbye is hard because of the gnawing pain of the absence after the separation. It’s no wonder that many of us are not very good at saying goodbye, many avoid it altogether. Or we try not to get close to people in the first place. As difficult and as painful as it may be, goodbyes are inevitable. Life is like that, people come and they go. You make a friend and then either they move or you move. There are births and there are deaths, beginnings and endings. The pain in this kind of letting go is often excruciating, as parents know, but to refuse to do that is to truncate life. Yes, goodbyes are not only inevitable, they are necessary. Without goodbyes we will never be greeted with new hellos, endings may not lead to new beginnings, a going cannot become a coming. 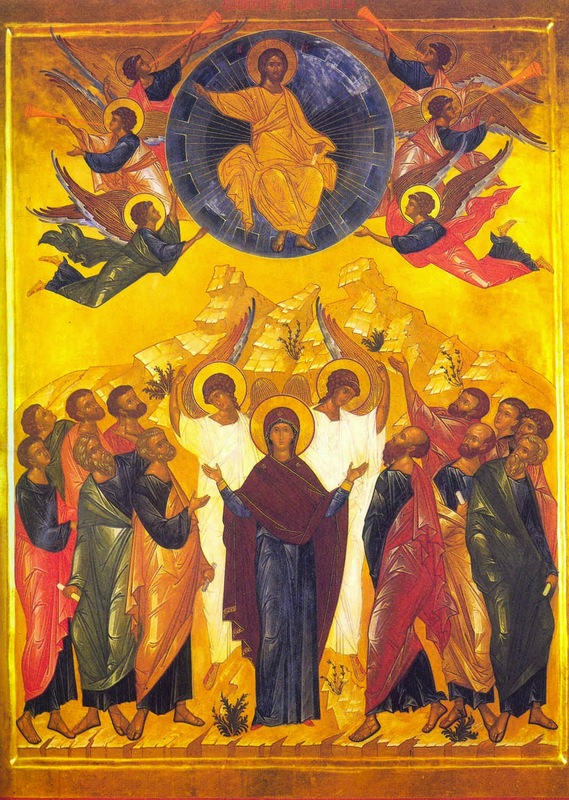 Without the Ascension, there will be no Pentecost. Therefore, the Ascension is both a going away and a coming. Even as he says goodbye, Jesus instructs his disciples not to leave Jerusalem but to wait for another who is coming. In His going, came the promise of the Holy Spirit’s coming. Therefore, the Ascension reminds us that an ending may actually be a new beginning. In fact, if Jesus did not return to the Father, the Spirit would not have come, the Church would not have been born, the disciples would not have been challenged to step out into the world and witness to the good news of the Kingdom and we would not have been here. The Ascension, therefore, names and highlights a paradox that lies deep at the centre of life, absence can lead to a deeper and more intense and profound presence. Absence does make the heart grow fonder. But in the case of Christ’s ascension, it does so much more. Hence the feast of the Ascension is not to commemorate a departure but the celebration of the living and lasting presence of Jesus in the church. He the Lord, the living head of his Body, the Church, remains always with us as he promised, but now in a new way. His “old” presence was limited by time and space. But now with the Ascension this gives way to a new presence that will reach the whole world in every age. The ascent to heaven is therefore necessary. In ascending to heaven, Jesus has now taken us up into God’s very being, participating in God’s powerful presence in this universe. In conquering death through his resurrection he has conquered fear of all the terrible consequences we imagine unfolding if we don't get life quite right. Freedom from this fear amounts to freedom from temporal ultimatums—that is, the belief that salvation can happen within the world. The great temptation in our contemporary world is to believe that we can truly solve the world's problems—perhaps with the next great invention, or the next great economic structure, or the next great medical discovery. Those things are great, and relieving human suffering is no small matter. But Jesus' ascension into heaven without solving the world's problems is a reminder that only God can truly save the world. Jesus does not commission the disciples to spread democracy, or distribute income more equally, or lobby for human rights: he ascends to heaven and tells them simply to witness to the reality that the portals of heaven are now opened. There lies the answer and the solution to all life’s problems. We live on the far side of Pentecost. We’ve already heard the commission and tasted the presence of the Spirit. But the message of Ascension Thursday is a good reminder, that we always live in the presence of Christ who has not abandoned us or left us orphaned. In this sense, we are never alone. His presence remains as we keep company with the Holy Spirit. His presence is real in the Blessed Sacrament, in the sacrifice of his body and blood at every mass. His presence is continuing in the action and ministry of the Church. No, Christ has not abandoned us or left us orphaned. No, Christ is not absent. More than ever he is present beyond the limitations of time and space. Between Pentecost and the Parousia, Christ’s triumphant return in glory, Ascension Thursday serves to remind us that we are constantly living in an age of transition. Although, we continually face the temptation to rest in the past or to cling on to the present, the future beckons us. It’s easy to pine for the “good old days,” to correct the wrongs in both society and in the world, to be tempted to dream and construct a false Utopia in the here and now. But as tempting as these might be, that is not where our future lies. In fact, to truly live entails saying goodbye to all these things. Our future lies with Heaven, where the Head has gone, surely the Body must follow. But till then, we live in the age of the Spirit, a Spirit who will guide us and support us. We live in the age of the Church, she who nourishes with the Sacraments, with the Body and Blood of Christ Himself, the medicine for immortality, the antidote to death and the life giving food for the journey. We live in the age beyond Pentecost, as we engage in the mission that God has set before us. So, “why are you men from Galilee standing here looking into the sky? Jesus who has been taken up from you into heaven, this same Jesus will come back in the same way as you have seen him go there?” No time for grieving, no time for reminiscing, no time for procrastinating. Let’s move on!